Last Saturday evening, Malcolm Mazow was called to the Torah as a bar mitzvah at the age of 83. The Mishnah teaches that a full life is 70 years; therefore, the age for a second bar mitzvah comes 13 years later. In his personal speech to us, he told us that he was the last bar mitzvah boy to be blessed by Rabbi Henry Barnston, one of only three senior rabbis who served Congregation Beth Israel between 1900 and 1999. But, his second bar mitzvah would be different. Two years ago, Malcolm made a personal decision to become a bar mitzvah, again. His journey commenced with renewed dedication to Torah study, Hebrew reading practice, and prayer study. Every week he met with his tutor, and every day at home he studied like a bar mitzvah boy, only this time his parents weren’t nudging him to practice. At Temple, he sat with his tutor in the conference room that shares a wall with my study. Very often, I was able to hear the beautiful sounds of chanting prayers, Torah blessings, and the Torah portion. I also heard the heart-warming sounds of laughter. He was making steady progress towards his goals. 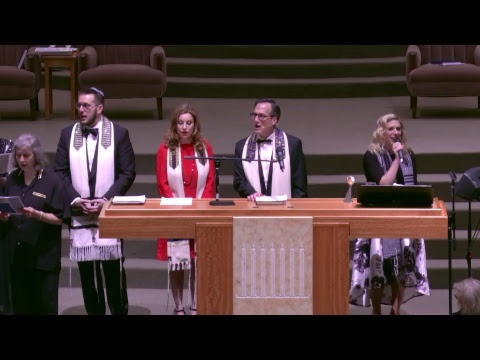 On Saturday evening, Malcolm took his place on the bimah, proudly wearing his tallis, which his granddaughter wore at her recent bat mitzvah. He began by chanting Ashrei, a praise to God. The congregation responded eagerly to support their friend. When we approached the Holy Ark, I took a large Torah and passed it from me to Rabbi Adrienne Scott, to Jackie, his wife, and then to Malcolm. I remarked that Torah transmission, from Sinai to Beth Israel, depends on the ways we make it our very own throughout our life. As Malcolm held onto the Torah, he faced the congregation and recited the Shema, an affirmation of his faith and ours in One God. After Malcolm carried the Torah around the congregation, he took his place before the scroll to read from the weekly portion. From his breast pocket, Malcolm withdrew his personal Yad, a Torah pointer. With it in his hand, he looked into the Torah and easily found his starting point. Jackie recited the Torah blessing and Malcolm began his Torah reading. He read masterfully as he placed the Yad over each word and pronounced it perfectly. Then Malcolm was called by his Hebrew name to recite the Torah blessing and continue his reading as a bar mitzvah. Though his hand was shaking slightly, he approached each sacred word and read it with confidence and joy. When the final word was read and the blessing recited, the congregation said, “Amen.” Then the sacred power of that moment washed over him and he smiled widely. In Malcolm’s bar mitzvah speech, he expressed his deep gratitude to family, friends, and to God. Finally, we welcomed Malcolm to stand before the Holy Ark, where Rabbi Adrienne Scott and I had the privilege of blessing the bar mitzvah boy as Rabbi Barnston did 70 years ago. The blessing of life is realized in more than the number of one’s years; they’re measured by one’s deeds. Malcolm has filled his years with extraordinary contributions of self, personally and professionally. His prayers have been generously answered and we are all beneficiaries of them. In the High Holy Day prayerbook (machzor), we read, “Avinu Malkeinu, enter our names in the Book of Lives Well Lived” (CCAR Press: NY, 2017). At any age, one should be inscribed for a life well lived, and at 83, upon the reading of Torah at a second bar mitzvah, Malcolm is grateful for his life and the ways it has unfolded before him. So are we. On behalf of a grateful congregation, Mazel Tov to Malcolm Mazow and his family on this milestone in your life. May you find your strength in words of Torah, and always be inscribed in the Book of Lives Well Lived.